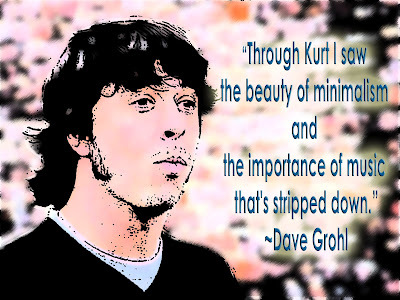 "Through Kurt I saw the beauty of minimalism and the importance of music that's stripped down." David Eric "Dave" Grohl is a rock musician, multi-instrumentalist, and singer-songwriter, who is the frontman, guitarist, songwriter and founder of the Foo Fighters, prior to which he was the drummer in the legendary grunge band Nirvana. He is also the drummer of the rock band Them Crooked Vultures. He has performed session work (as a drummer) for a variety of bands, including Garbage, Killing Joke, Nine Inch Nails, The Prodigy, Slash, Juliette Lewis, Tenacious D, Tom Petty and the Heartbreakers, and Lemmy Kilmister. His mother appears in Foo Fighters' "Breakout" video. George Harrison was his favourite Beatle, and he wrote the song "Oh, George" in dedication to him in 1994. Before joining Nirvana, Grohl had been a member of the bands "Scream" and "Dain Bramage"